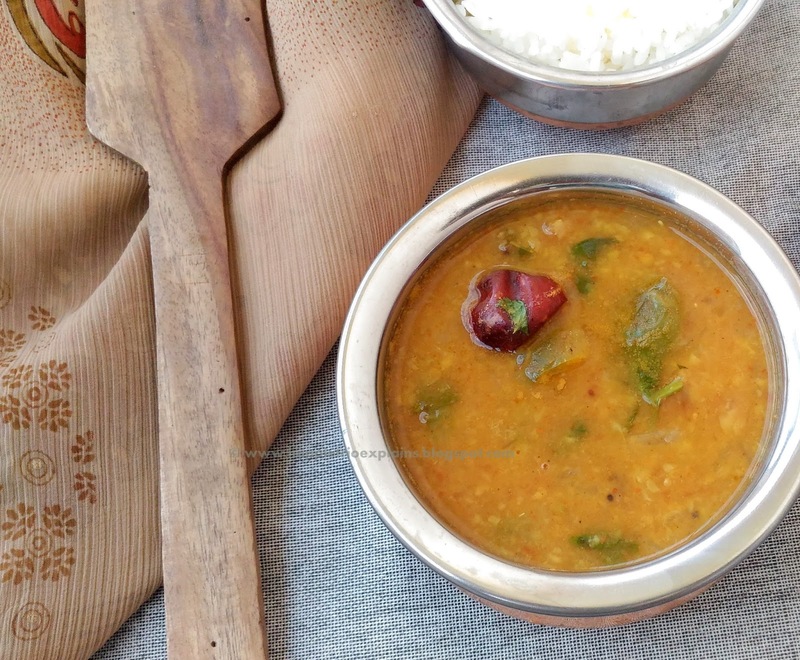 Capsicum or Bell Pepper Sambar is a mild Sambar that is usually served for breakfast along with Idly or Sambar .When you have no fancy veggies left out in your fridge then this capsicum sambar can be made as an accomplishment. It is so easy to prepare this will definitely save your time and there will be no compromise in taste on a busy working day. 1. Soak toor dal in water for 10 mins and then in a pressure cooker add in toor Dal,Shallots/Onions ,Tomato ,Garlic and Hing and Pressure cook for 5 whistles or till the dal is cooked. 2. After cooking the dal mash it well so that no whole dal is present and then to the dal mixture add in Sambar powder, Chilli powder, Turmeric powder, Salt and mix well. 3. 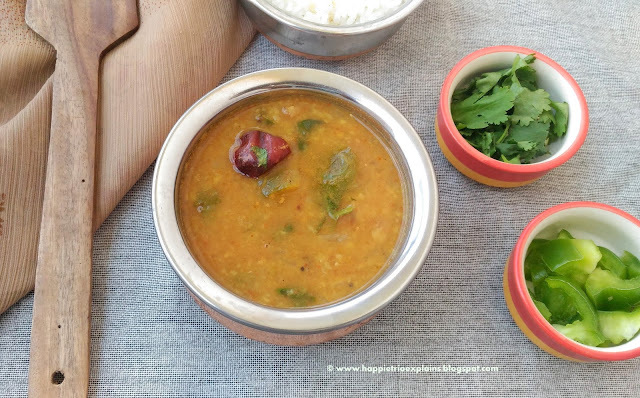 Soak in Tamarind in water and add the tamarind water to the cooked Dal and mix well. 4. In a pan add in the oil or Ghee Once it heats up add in Mustard Seeds, Cumin Seeds, Fenugreek seeds and Hing and mix well then add in the Dry red chilli and Curry leaves, next add in the cubed Capsicum and sauté well for another 5 mins in medium flame. No need to cook the capsicum fully, let it retain its crunchiness. 5. Now add in the Dal mixture along with the capsicum and cook everything together till it comes to a boil in medium flame. Garnish with Coriander leaves and switch off the stove. I prefer my sambar big tangy so I added Tamarind you can actually skip that as we have anyhow added tomatoes. Use Shallots is advisable for sambar. Tastes best when served with Idli or Dosa along with Coconut Chutney. The customary gravy in my house, love this one with capsicum. Nice idea. Nice sambar !!!.... new to me with capsicum. ... will surely try it . Looks so delicious. I would also like to add tamarind even though tomatoes are already in there. Nice presentation. 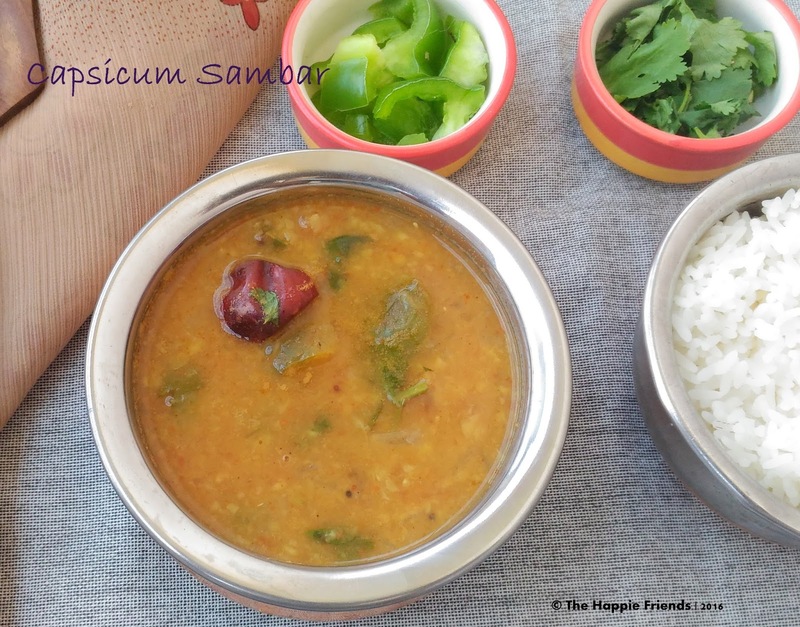 Yummy and flavourful sambar!! Nice clicks!! Addition of capsicum sounds great. Looking very delicious! Thanks for sharing!